Lining: AMES Guide 1:1 scale setting #6, 1:3 minim:interlinear height ratio for secretary hand, 3:1 for gothic. I was asked to pen a letter of invitation from Syr Marcus Blackaert, autocrat for the upcoming Great Northeastern War, to their Highnesses. I felt fairly relaxed about this assignment, despite it being a letter to royalty. I'm not sure why that was, but I decided to use it to my advantage and try something new. I had less than a week to finish it, so I couldn't spend too much time experimenting before getting right to work. 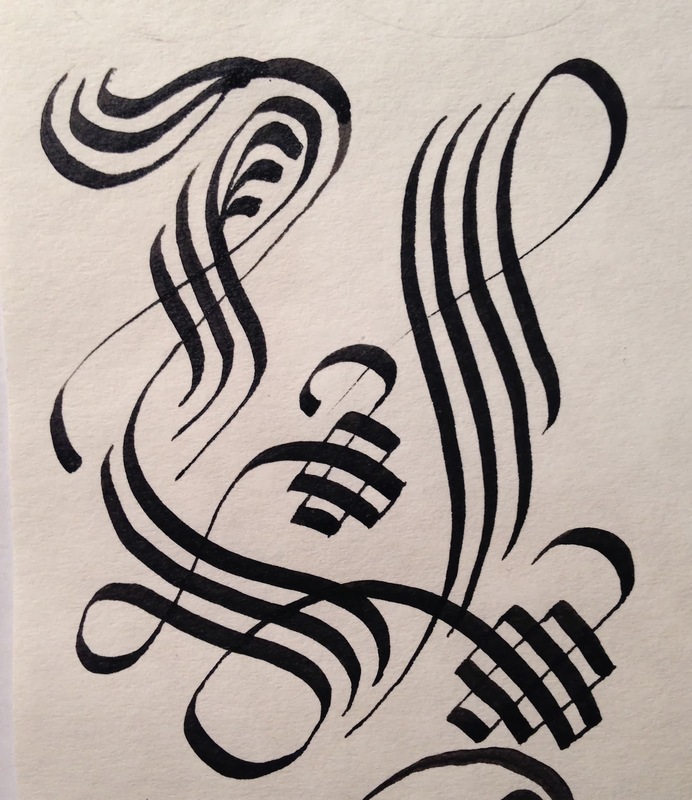 I took my inspiration from the style of the work of Master Edward MacGuyver dos Scorpus, a friend, inspiration and fellow calligrapher in the SCA. His works are masterpieces in black and white, produced only with calligraphy pens. They usually feature a huge initial capital dominating the page made from cadels and pen flourishes, and are finished with a highly ornamented form of gothic for the rest of the text. I also took inspiration from the style of some late-period legal documents. I started by figuring out a design for a cadel version of the letter U. My first complete attempt. 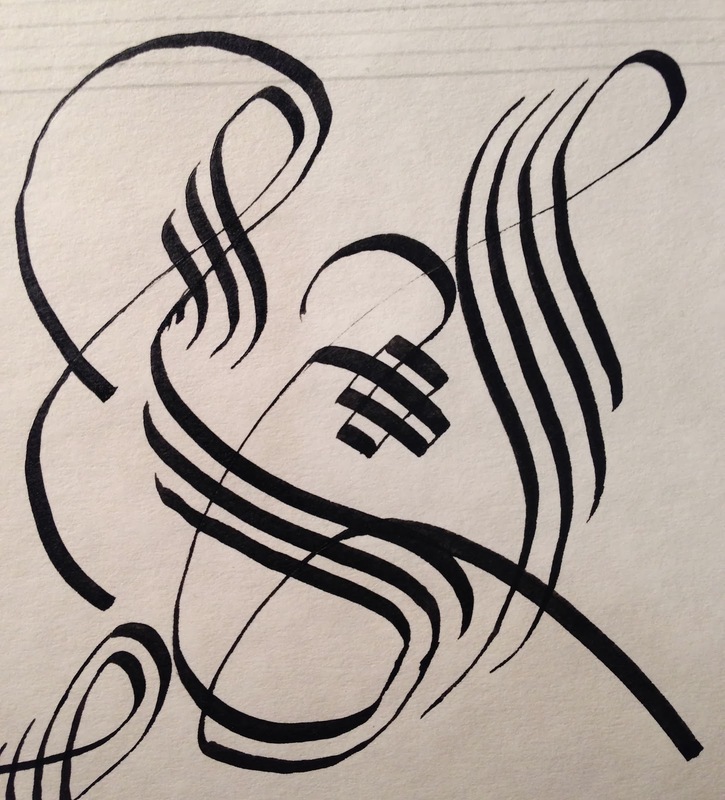 I was happy with the general shape and position of base strokes, but felt that the flourishes needed work, and the bottom was a little too pointy, looking more like a V than a U. Attempt number two. Here's where I figured that I really liked the cadel grids in the middle and lower right. 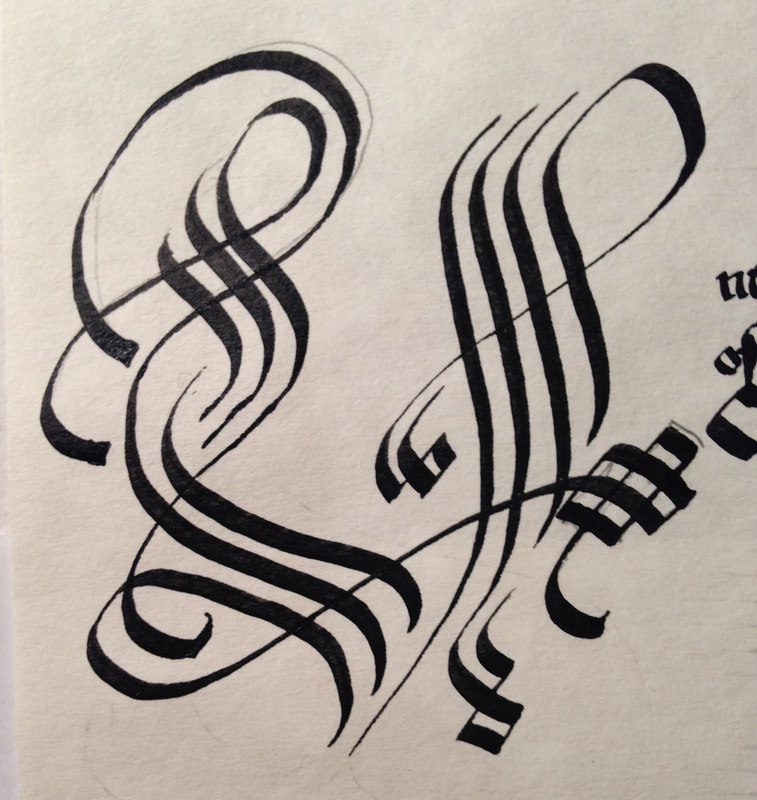 I wasn't happy with the extra flourishes in the upper left, or the dual loops on the bottom left. The top of the letter was also a little too closed, still looking more like a V than U. Attempt number four. Almost there, but I was unhappy with how the cadel grids were at two different angles, and how the top right was so much higher than the top left. Given my limited time, I decided I had practiced enough to figure out what I liked and didn't, so I lined a piece of Pergamenata and carefully put down the final version. I focused on keeping the white space even between the parallel strokes, and not dragging my hand through any still-wet ink! This part was all done freehand, with no pencil marks made first. After looking at it for several hours, it felt like it was missing something. The lower left was too empty. 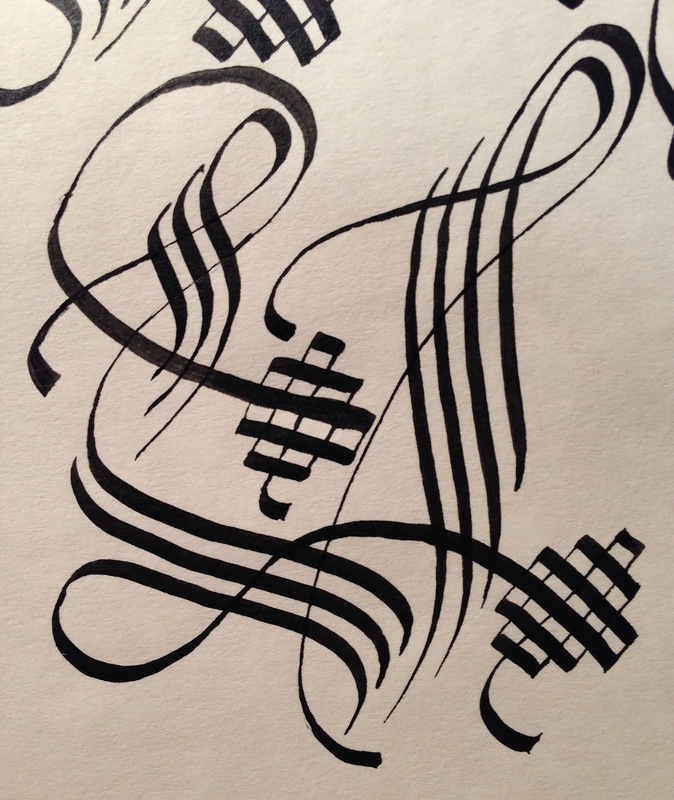 I penciled and erased a few options until I settled on the loop flourish with the small cadel grid on the end. Now the right side felt lacking. In the picture above you can see where I had already sketched a pencil line with an option to fill the space. After living with the pencil line for a while, I decided it worked and inked it. I also used tip of a sharp knife to clean up a couple blotchy lines. The final letter isn't nearly as fancy as one of Master Ed's, but I'm quite happy with the result. I pushed outside of my own comfort zone and was rewarded. For the text, I had decided early on that I wanted to do more than "just" a secretary hand. I wanted to emphasize a few of the words in the text to make them really call out the important aspects of the message. Overall the effect worked as I had hoped, though the Gothic might have been a tad too large, cramping together on the top three lines. I was reminded during this project how much I love working on Pergamenata... The pen glides so smoothly leaving the ink floating on top with crisp edges. The final result has such visual depth to it from this and the translucency of the Pergamenata itself. It's also easy to scrape off any mistakes, barely touching the surface of the paper when doing so. I would use it more frequently, but I know it can be a pain when applying paint and gilding, as it likes to warp and buckle from moisture.